The first time I saw China Daily was when I was in high school. 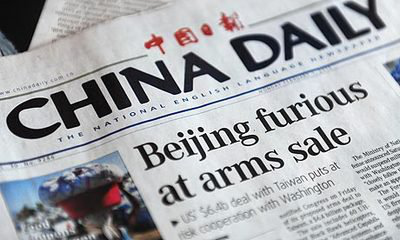 Influenced by our English teacher, I often bought China Daily newspaper from a news bookshop. But as a high school student, it was difficult for me to thoroughly understand the meaning of the news. Though difficult, I still tried my best to read through a whole page and checked the words I didn't know in the dictionary. During that time, I learned much more vocabulary outside of class. And also during that time, I formed the habit of reading China Daily newspaper often. I have to say, due to my habit, my knowledge has become rich and my horizons have widened. In China Daily, I can learn about cultures, customs and news all over the world without traveling there in person(亲自). My most favorite section is the Cultural section. I like discovering the differences between Chinese culture and other nations’. What do other people in other nations eat every day? Do they eat the same food that we Chinese people eat every day? What kind of festivals do they celebrate? All the above questions will arouse my desire to seek knowledge. So China Daily becomes the first choice for me. China Daily has become a part of my life. Now I am working for a foreign company in Beijing, and I never want to give up my habit of reading China Daily. I love China Daily! 1. When did the writer read China Daily? A When he was in primary school. B When he left school. C When he was in high school. D When he was in a university. 2. How did the writer deal with the new words? A By asking the teachers. B By guessing the meaning according to the passage. C By searching for the information on the Internet. D By looking them up in the dictionary. 3. The writer’s favourite part of the newspaper is _______. 4. From the passage, we can know the writer may be _______ now. A Different countries, different cultures. B China Daily and my life. C How to improve your English. D How to form a good habit.